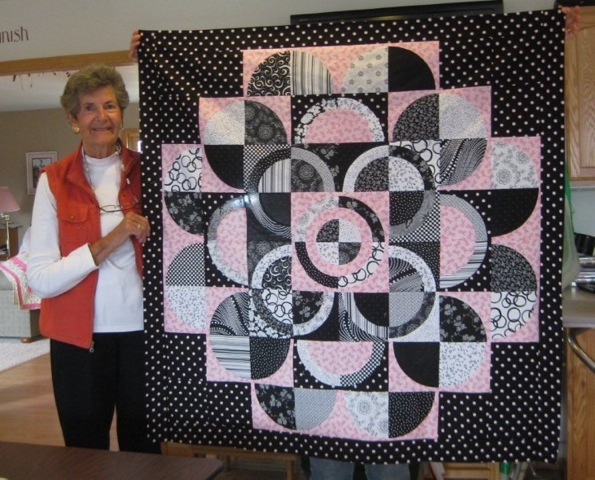 Circle of Hope Quilt Pattern celebrates cancer survivors! We love it when we hear from our customers and here’s once such case. Since October is National Breast Cancer Awareness Month, it seems the appropriate time to share this. When I first saw this quilt it was done in navy and tan. I loved it. I ordered the pattern and you can imagine my surprise when it (the cover) arrived in black/white and pink. At the time I was dealing with breast cancer. Just the title “Circle of Hope” had a special meaning for me. I found pink fabric with cancer ribbon on it and the pink polka dot online. My search for different blacks and whites began. What fun. I am now hand quilting my assembled quilt and want to have it ready for our quilt show in March. Why am I writing you? I would like your permission to show my quilt with pride at our show. Of course we said “YES!” Mary also included a picture of herself with her finished quilt top and gave us permission to share it with all of you. Mary, we wish you nothing but excellent health in the future. The same goes to all cancer survivors. Our hats are off to you! Want to make your own Circle of Hope? You can find the pattern on our website. It was designed by Susan Mayer, one of our more prolific designers! This entry was posted in patterns and tagged Susan Meyer. Bookmark the permalink. 2 Responses to Circle of Hope Quilt Pattern celebrates cancer survivors!